John McCain wants us to believe that with his vast experience in Congress, he will make better decisions than Barack Obama. But McCain has a long history of poor judgment – one that he even admits when pressed. McCain was one of the infamous “Keating Five” – five Congress members who tried to help the worst savings and loan of the 1980s crisis get around regulators. Between 1982 and 1987, McCain received $112,000 in political contributions from Charles Keating Jr., then chairman of the failed Lincoln Savings and Loan Association, and his associates. McCain and his family made nine trips at Keating’s expense, sometimes using Keating’s jet, according to news accounts such as the Arizona Republic. Three of the trips were made during vacations to Keating’s Bahamas retreat. McCain knew how to pay back such generosity to his family. While in the House of Representatives, McCain was among the sponsors of a resolution to delay new regulations designed to curb risky investments by thrifts such as Lincoln. When regulators investigated Lincoln for violating laws in 1987, Keating asked McCain and the other Congressmen to meet with regulators and plead his case. At first, McCain was “nervous” about doing so – and Keating called McCain a “wimp” for being concerned about the meetings, according to the Arizona Republic. But McCain finally agreed to do it after saying he would just ask questions about Lincoln’s treatment, not plead the thrift’s case. So on April 2, 1987, McCain and three other senators met with Ed Gray, then chairman of the Federal Home Loan Bank Board. A week later, McCain and four senators met with William Black, then deputy director of the Federal Savings and Loan Insurance Corp., and other federal regulators. Black told the Republic that McCain was acting the “weirdest” of all the senators. “McCain was always Hamlet . . . wringing his hands about what to do,” Black said. By the time Lincoln failed in 1989, McCain had wrung his hands long enough to distance himself from Keating. Lincoln was the most expensive failure in the scandal, as taxpayers lost more than $2 billion alone to bail out that thrift. Others such as former Sen. DeConcini continued to defend Keating until his thrift failed and the feds filed a $1.1 billion civil racketeering and fraud suit against Keating, accusing him of siphoning Lincoln’s deposits to his family and into political campaigns. The Senate Ethics Committee investigated McCain and other Keating Five members. In 1991, the committee decided to blame most of the mess on DeConcini and former Sens. Riegle and Cranston, while only mildly rebuking McCain for showing “poor judgment” in meeting with regulators on Keating’s behalf. DeConcini claims that McCain leaked to the media “sensitive information” about certain closed proceedings in the case to help make DeConcini, Riegle and Cranston take the fall. A congressional investigator, Clark B. Hall, later told the Boston Globe that McCain was one of the “principal leakers.” McCain, under oath, denied involvement with the leaks, but he was testy when a Republic reporter asked him about an alleged business relationship between Keating and McCain’s wife, calling him a liar and idiot. Keating was convicted in state court in 1992 of fraud, racketeering, and conspiracy and received a 10-year prison sentence, serving less than five years. In 1983, McCain opposed the creation of a federal holiday honoring Martin Luther King Jr., even though Reagan signed the bill. As late as 1994, McCain voted to cut off funding for the commission working to promote the King holiday. Jack Thor is the pen name of a Washington, D.C.-area journalist/writer. 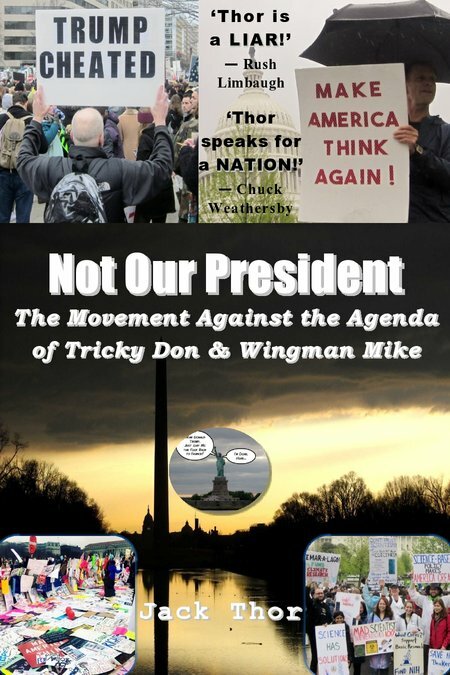 Books include Not Our President [2019 update], The King of the Internet , and Born to Cheat . A Deeper Look at the Black Bloc: Did Trump's People Fund these Anarchists?